Home › Articles & Blogs › Funding for Super Conservationists! The new application round for the 2016 Future For Nature Award is open. The Future For Nature Award means a price of € 50.000,- and a lot of publicity for your conservation work. Please note that you can also propose a candidate for the Award. The deadline for the applications is 15th September 2015. Feel free to share this information with your network. We’re looking forward to receiving the applications. We wish all the participants good luck. 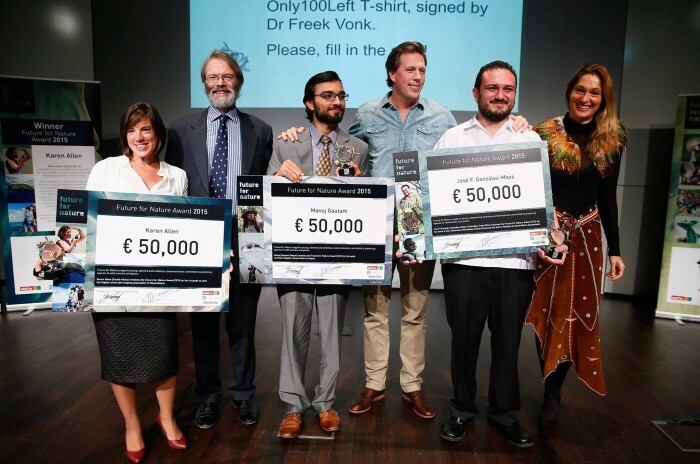 Consists of three prizes of €50.000 for three young conservation heroes. Is a reward for outstanding achievements in the protection of species of wild flora and fauna. Stimulates Award winners to sustain their dedicated work, to raise their profile, to extend their professional network and to strengthen their funding basis. Aims to boost a new generation of young conservationists worldwide. The candidate should not be older than 35 years on 30th of April 2016, i.e. born after 30th of April 1981. The candidate has achieved substantial and long-term benefit to the conservation status of one or more animal and/or plant species or that of a specific population of one or more animal and/ or plant species. The candidate has demonstrated leadership and entrepreneurship in his/her conservation work. The candidate has been creative and innovative in his/her work. Work related to the conservation and protection of endangered species (IUCN’s Red List) is given priority. Please note that the Future For Nature Award is awarded to individuals, not to organizations.